to allow online voter registration by 2017. Online voter registration has become so popular because election officials say it's more efficient than a paper-based system, and cheaper. right before an election, and get that into the system," he said. Arizona, for example, says it costs the state only 3 cents to register someone online, versus 83 cents on paper. driver's license or other state databases, and verified. adding that this can avoid a lot of problems on Election Day, especially if the error involves the spelling of the voter's name. 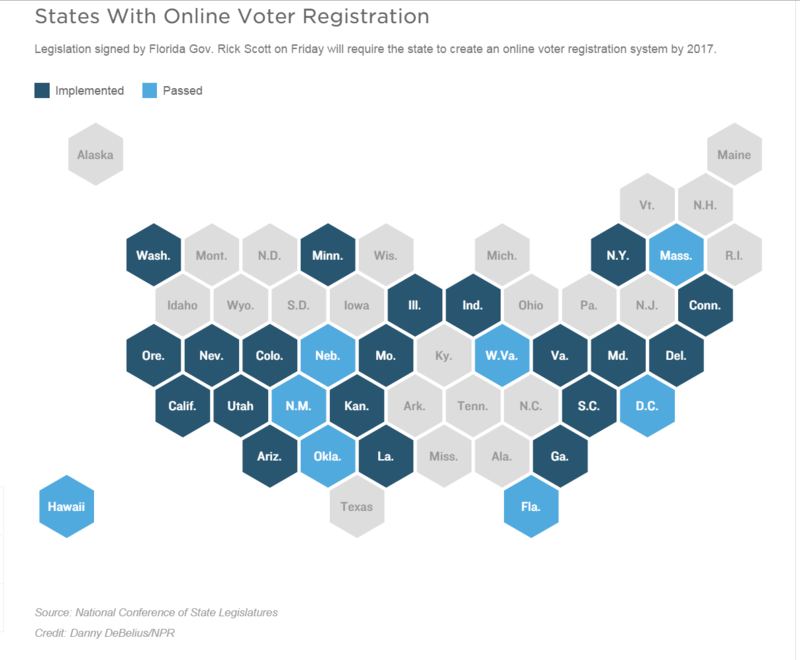 Online voter registration also turns out to be one of the few areas in running elections where many Republicans and Democrats agree. confidence level in technology," he said. But today, Schedler is a huge fan. He said more than 220,000 people have used the system so far, with no reported problems. "You can go straight online and do it. It takes about two minutes — three minutes max — and it's done," he said. "with some hesitation." Scott said he was worried about meeting the October 2017 deadline, especially with a presidential election on the way. And his secretary of state, Ken Detzner, told lawmakers last month that he also opposed the bill because it was a massive undertaking. heap of trouble," Detzner said. once it's in use. And you want to have a strategy for what happens if there's a failure of the system at a critical moment, like Election Day." the first time they appear at the polls as an extra precaution, she said. For everyone else, registering on paper is still an option. registration is almost identical to what it was before. Red states are just as red; blue states just as blue.